Acerola with magnesium in capsules. It provides 100mg of acerola per daily dose. Acerola powder with vitamin C. It provides 3.2g of acerola and 160mg of vitamin C per daily dose. 80mg of Vitamin C from Acerola. The acerola is a fruit whose flavor goes from bittersweet to acid due to its ascorbic acid content (from one to two grams per 100g). It has a unique sweet scent and it holds a great amount of properties for our health. 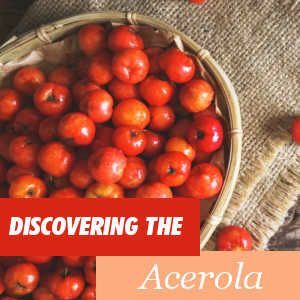 Where can we buy Acerola? HSN has acerola supplements available so that you will be able to benefit from its benefits for our health. You can browse the catalog, place your order and enjoy your products with the fastest shipping! The acerola is a berry from a shrub whose scientific name is Malpighia emarginata and it belongs to the malpighiaceae family. It is usually mistaken for a cherry due to their similar appearance. However, if we look closer, we will be able to see many differences between them.